Anyone who’s ever had a brick fall on one’s feet knows how much it can hurt. It’s little consolation if that brick is made of gold. What’s happening to the price of gold? And has our outlook changed, be that for gold, the U.S. dollar or currencies more broadly? China’s GDP growth has slowed to 7.7%, ushering in an era of more modest growth. In the past, disappointing growth numbers out of China have, on occasion, been a negative for the price of gold, as well as broader “risk sentiment”. Indeed, as European Central Bank (ECB) President Draghi has recently pointed out, the reason the ECB isn’t printing more money is because other central banks have shown that it doesn’t work. For the time being, the market appears to agree: the printing presses have not achieved a great deal, as exemplified by lackluster growth in the developed world. Indeed, we have pointed out many times that the biggest threat we might be facing is economic growth. That’s because once the money that’s been “printed” starts to “stick”, then deficits start to matter as bond markets throughout the world might sell off. The Eurozone has not fallen apart, and rampant inflation has not taken hold. Sure, certain prices have skyrocketed, but overall, the market as a whole is rather complacent. As such, it’s only reasonable for gold to take a breather. There’s a lot of “exit” talk at the Federal Reserve (Fed) with even doves calling for a phasing out of purchases towards the end of the year. Never mind that a “phasing out of purchases” is not an exit. As we discussed in our recent analysis “Fed Exit - What Exit?”, much of this talk might be wishful thinking. Surely the Fed would like to go back to a more normal environment, but recent disappointing data, such as disappointing nonfarm payroll and retail sales reports show that such talk might be premature. Still, forward looking markets might start to price in that “at some point” there may be an exit from the highly accommodative monetary policy. In the past, we have cynically indicated that there’s never been a Eurozone crisis; instead, there’s a global crisis. It is naïve to think that Japan’s problems are all solved with the one time salvo of the Bank of Japan. Similarly, the Bank of England is about to get Mark Carney as their governor, suggesting that a higher inflation target and/or nominal GDP targeting is in the cards. And in the U.S., Bernanke’s term is ending early next year; the last time we checked, Paul Volcker was not the most likely candidate to succeed Bernanke, but super-dovish Janet Yellen was the frontrunner. Taken together, there are plenty of reasons to believe that we haven’t seen anything yet with regard to the price of gold - and with that, we mean on the upside. However, investors were reminded of the fact that gold is historically rather volatile, even if recent volatility is on the high side even by historic standards. We also have to keep in mind that a lot of technical damage has taken place: many investors that bought gold in the past 2 years have paper losses and might be eager to sell on rallies. From our point of view, volatility is your friend, as it shakes out weak holders of gold, making price appreciation ultimately more sustainable. The recent volatility in gold does raise a broader concern: it appears there are fewer and fewer actors in the markets, with trading ever more driven by computer models and hedge funds. When the going gets tough, few bids are in the markets. That’s a challenge going far beyond the yellow metal, extending to stocks and other markets. Reduced liquidity makes for rocky markets. On that note, don’t think for a moment that there is a place to hide: as we have indicated many times in the past, there may be no such thing as a safe haven anymore; in holding U.S. dollar cash, one’s purchasing power may be at risk. But holding gold is certainly not “safe” either if you value your holdings in dollar terms rather than by the amount of troy ounces held. Central banks have addressed this challenge by diversifying to baskets of currencies, including gold. Investors should not trust that their government will preserve the purchasing power of their currencies for them, but may want to take a more active approach. We happen to like currencies - and I shall group gold into this as the ultimate hard currency, as they carry no equity risk and typically low interest and credit risk; as such, in a volatile world, currencies and gold allow one to take a direct position on what we call the ‘mania’ of policy makers. We may not like what policy makers are up to, but we think that they are rather predictable. Japan. In line with our forecast, the yen has weakened rather dramatically in recent months. In days of extreme risk aversion, such as this past Monday, the yen continues to be a beneficiary. But our analysis has shown that its status as a beneficiary of the “flight to safety” has continued to erode. Nothing goes down in a straight line, and the yen is no exception. Our medium term view on the yen is unchanged. With Japan’s current account deficit eroding, Japan’s massive debt burden is going to matter. Japan will, in our assessment, get more than it is bargaining for. Our outlook for the yen continues to be grim, as in worthless. Keep in mind, though, that Japan is large enough to matter for the rest of the world, fostering not just liquidity, but also volatility that may well be exported as Japan morphs into new stages. The one thing more dangerous than a determined politician is a determined politician with a two-thirds majority in parliament. We called the euro the potential rock star for 2013. But have since indicated that it may be a rocky ride to rock stardom. While it’s become clear by now that policy makers in the Eurozone are more willing to tax widows and widowers than cede sovereign control over their budgets, we are encouraged by the fact that the market is ever more differentiating, targeting pockets in the Eurozone, such as a national banking system or select sovereign bonds, rather than selling of the euro as a whole whenever a crisis flares up in the Eurozone. Please see our analysis “Buy or Sell the Euro? Chaos Investing Unplugged”. With regard to the British pound sterling, we continue to await the arrival of Mark Carney, the current head of the Bank of Canada, to steer the Bank of England (BoE). In the meantime, however, as the BoE is in a holding pattern, the sterling is a beneficiary while the market focuses on crises elsewhere. Canada’s economy is weakening, but here too we await the announcement of the successor to Carney. As we have previously indicated, if Macklem, his current deputy, is appointed, we may get a real hawk at the helm of the BoC. Similarly, the Australian economy is weakening, with the commodity sector possibly hit particularly hard in the second half of the year. What holds up the Australian dollar is the massive money “printing” in Japan. That has left us cautiously optimistic, but - just like any investment - it’s not a risk free proposition. Early this year, we indicated that the New Zealand dollar is our favorite in the region; we continue to like the kiwi, as the currency is also called, but it’s not immune from a broad-based selloff in the markets. The Chinese yuan has done quite well, in line with our expectations. China is likely the most prudent player in Asia, as other countries get ever more nervous about Japan’s activist approach to the yen. In that context, our more cautious view on the Korean won has also shown to be prudent, as Korea has most to lose when the Japanese yen is weak, as the country sees its car export market threatened. Clearly, there’s added volatility in the Korean won based on the tensions with the North. 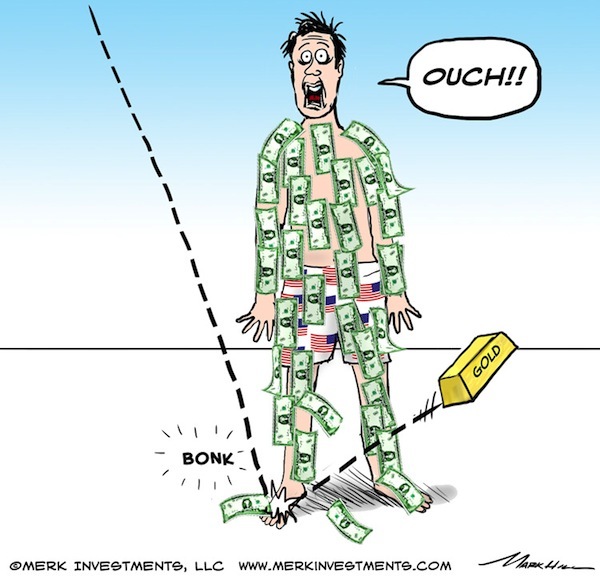 With regard to the U.S. dollar, as we indicated, some Fed officials might have gotten ahead of themselves. It’s almost as if they listen to staffers at the Federal Reserve Open Market Committee (FOMC) give their predictions, then carry that word to the street, without them actually paying attention to the interim news flow. Much of this is also a symptom of the times that the Fed might be “flying blind” as it controls the entire yield curve, robbing policy makers of feedback from the markets necessary to conduct prudent policy. Please make sure you register to join our Webinar this Thursday at 4:15pm ET, as we dive into more depth on our outlook on currencies and discuss the next steps for the price of gold. Also make sure you sign up for our newsletter to be the first to learn as we update our outlook.